SEOUL -- Hwang Seung Ho wants to take a wrecking ball to the fortress mentality at Hyundai Motor Co. The Korean automaker is the crown jewel of the mighty Hyundai Motor Group, a sprawling conglomerate with companies spanning industries as diverse as steel, construction and financial services. When the company needs metal for its Hyundai and Kia models, it can choose from three steel-making affiliates. For front ends, seats, lamps, axles, engines and transmissions, Hyundai’s vast internal network of parts makers can produce them all. Yet these days fast-moving technologies are transforming the auto world at a blistering pace. And a go-it-alone strategy won’t cut it anymore, according to Hwang, Hyundai Motor’s executive vice president of information technology development. Hwang thinks the world’s fifth-biggest carmaker needs to be far more open to tie-ups with tech upstarts and Silicon Valley giants to remain competitive in the race to dominate the coming era of connected cars and autonomous driving. Hwang, 60, is a rare bird at the insular Korean company, whose top brass is dominated by lifers. He joined Hyundai two years ago from Samsung Electronics Co., where he led work semiconductor development. Before that, he spent a decade at Silicon Valley startup Silicon Image, where he helped develop high-definition multimedia interface, a technology that improved the audio and video quality of computer monitors and TVs. There’s no denying that membership in the Hyundai empire has its privileges. The vast resources at the conglomerate has allowed Hyundai Motor and Kia Motors Corp. to realize cost savings, according to Ed Kim, a vice president at researcher AutoPacific Inc. Unlike rival automakers, Hyundai and Kia have snubbed joint ventures or alliances to make high-cost, low-volume sports cars and electric vehicles. However, Kim says the companies lack expertise in advanced driver-assist systems and autonomous technologies. Hyundai has been among the most aggressive automakers adopting Apple CarPlay and Android Auto, which integrate iPhone and Android handsets with car dashboards. In China, it’s embraced a similar system from search-engine giant Baidu Inc. called CarLife. In opening up to these tech giants, Hyundai’s building on a strength. Telematics and infotainment systems are what’s separating winners and losers in J.D. Power’s Initial Quality Study, which ranks brands on how many problems consumers have with newly-bought vehicles. Kia became the first non-premium brand to hold the top spot in the 27-year history of the study this year, ahead of Porsche. Hyundai ranked No. 3, beating out Toyota and its Lexus luxury brand. The triumph in J.D. 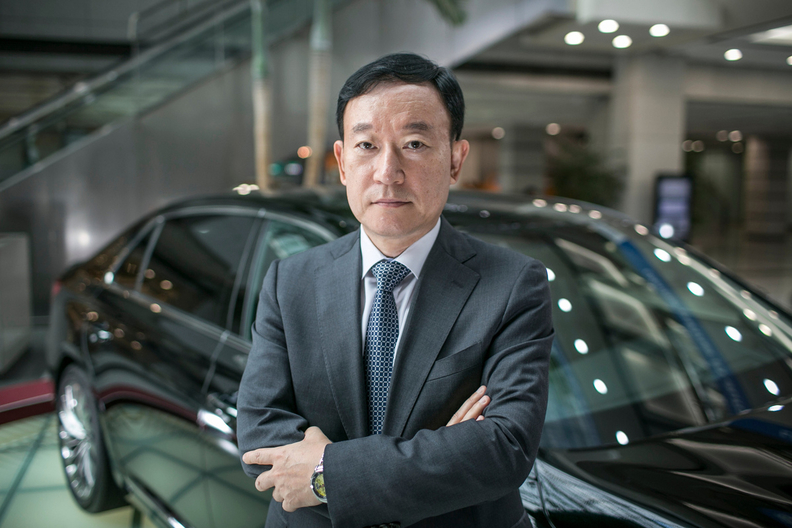 Power’s study was vindication for Chung Mong Koo, who made quality a top priority when he became chairman and CEO of the Hyundai group in 2000. That year, Kia ranked dead last in J.D. Power study, and Hyundai ranked only three spots higher among 37 brands. Hwang’s office overlooks Hyundai’s 870-acre r&d center in Namyang, about 30 miles away from Hyundai’s headquarters in Seoul, where he and 11,000 other employees navigate a campus crawling with thousands of cars in development and covered in camouflage. During an afternoon visit in July, test drivers were putting the new Genesis G90 luxury sedan through its paces on a 2.8-mile test track, reaching 137 mph into corners built with 45-degree-angle embankments. Hwang’s vision is to make connected cars that can provide customers the experience they value with their smartphones, without the bugs or need to press a reset button -- flaws that are intolerable when trying to drive safely and without distraction. In the realm of autonomous driving, Hwang’s drawn inspiration from AlphaGo, Google’s DeepMind’s AI system, that captivated the artificial intelligence community by beating Korean phenom Lee Sedol at the more than 2,500-year-old Chinese board game Go in March. Hwang’s targeting a driving AlphaGo system that can autonomously navigate streets and provide intelligent services to the driver using big data. Hwang and Chung Eui Sun, Hyundai’s vice chairman and son of the CEO, paid a visit to Cisco Systems Inc.’s California headquarters last year to discuss a potential partnership. The heir apparent Chung is personally involved with development of connected car and autonomous vehicles, checking and guiding all major projects in the space closely, Hwang said. Hyundai Mobis Co., the group’s largest parts supplier, and several of its fellow affiliates hold monthly meetings on their progress developing driving-assistance systems. But Mobis also is actively seeking to reach out to startups outside South Korea to keep apprised of the fast-changing technology. Hwang Jae Ho said he’s managing about 80 projects and is in discussions with startups in Israel, the U.S. and Europe on the feasibility of working together. Hyundai Mobis is open to collaborate with competitors and tech companies such as Samsung Electronics and LG Electronics Inc., he said. The company recently signed a contract to partner with vision-based driver assistance system supplier Mobileye NV.